New Zealand is bracing for Cyclone Pam, with flooding and power outages already underway. Some areas declared a state of emergency and locals are being evacuated. 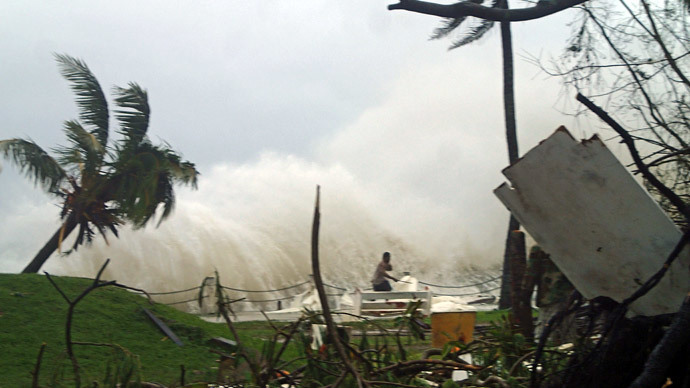 Strong winds are reported, as devastation in Vanuatu is fresh on everyone’s minds. One of the first areas to declare a state of emergency was the Chatham Islands, southeast of the two main islands of New Zealand. Over 40 people have already been evacuated from the Gisborne region in the northeastern New Zealand. The area has been getting hit with heavy rainfall on Monday, with wind speeds reaching 145km/h. People have been running to grocery shops to stock up on supplies. "...Stores have seen customers purchasing increased volumes of water, batteries, candles and canned food. Staples such as bread and milk have also featured as people made sure they had enough provisions to get through the storm," a Foodstuffs spokeswoman told the New Zealand Herald. Gisborne residents were told to get enough emergency supplies for at least three days. The cities of Auckland and Northland in the north part of the country have been experiencing thousands of power outages throughout the day. Even though meteorologists downgraded Pam to an “intense extra tropical cyclone,” MetService warned that parts of New Zealand are at risk in light of severe weather conditions. Over 150mm of rain had already accumulated around Gisborne in the past 24hours, as Pam continues to move southeast with the same intensity. The storm is expected to reach the Chatham Islands on Tuesday. Cyclone Pam first hit Vanuatu during the weekend — a state of about 83 islands located east of northern Australia. The damage has been labeled catastrophic, according to Reuters, with least eight people killed and 20 injured. Houses, boats and bridges were said to be destroyed, as the wind reached 300kph. First aid teams arrived in Vanuatu on Sunday. One of the country’s islands, Tanna, suffered “widespread devastation,” an official at the Australian Red Cross told Reuters. "Virtually every building that is not concrete has been flattened." Dozens more people are feared dead, but the total number of casualties and those injured can only be known later as entire remote villages in different islands are reported to be destroyed. Earlier, the UN was citing unconfirmed reports of 44 dead.